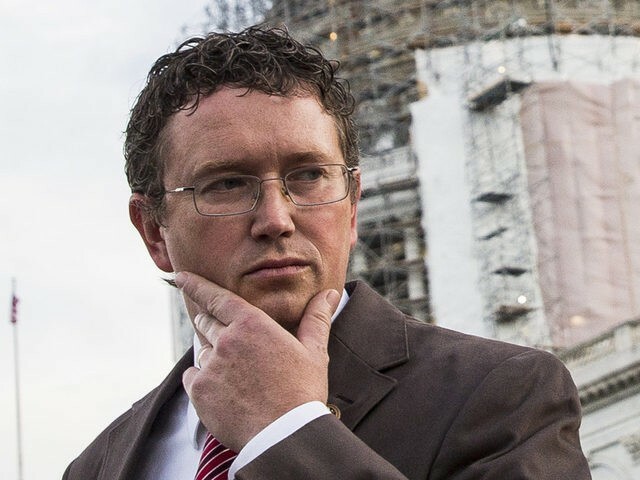 Rep. Thomas Massie (R-KY) argued on Friday night that President Donald Trump has no authority to strike Syria. On Friday night, President Donald Trump announced that he had ordered precision missile strikes on Syria in reaction to the Syrian leader Bashar al-Assad’s alleged use of chemical weapons. Trump added in his televised press conference on Friday night that Britain and France will join the United States to bomb Syria. “We are prepared to sustain this response until the Syrian regime stops its use of prohibited chemical agents,” Trump added. President Trump stated that America does not seek “an indefinite presence in Syria, under no circumstances. As other nations step up their contributions, we look forward to the day when we can bring our warriors home.” Trump added that the fate of the Middle East ultimately lies with its people.